In 1995 Niki saw her first llama driving at a llama show. At that time, not only did she think it was fascinating, but she vowed to someday drive a llama too. In 1997 we began driving llamas. Prior to this, Niki had experience driving Percheron horses and helped with driving/hitching up a pair up to 8 horse hitch. Working with the horses and seeing how the equipment worked and the horses, gave Niki valuable insight into driving. During a Jim Logan clinic Niki attended, Jim asked the class who the black and white llama was that he had spied around the farm and added that this llama would be amazing in a llama cart......That llama was ﻿Isle Eagle! ﻿In 1997 Niki began to ground drive and work with Eagle and within a matter of days he had mastered most of the basics of ground driving. Within a week or two, he was in the cart and driving! The first time he was put into the cart, he threw a tantrum and chipped his front tooth on the road. Dannie Sayers who was Niki's friend, llama mentor, 4H connection and got her started in llamas commented at that time as she took a picture, "If I know Niki this llama will go on to be amazing, I am taking a picture to remember this!" This was the start of Niki's obsession with driving llamas! Eagle began cart driving miles from the start. Easily learning to walk, trot and lope on command. Even learning an overdrive sound for going up hills at a dead run! Niki and Eagle would cart drive as long as there was daylight and quickly became proficient at it. It became apparent that Eagle was born to drive and this was his thing! Eagle and Niki went on to be the best driving pair of all time. It was even more amazing because of the fact that they had trained each other and had a very special relationship. Eagle knew what Niki wanted him to do before she asked. He was able to perform a walk, trot and lope on the correct lead. Eagle could also perform figure eights in those gaits too. His backing was stick straight and able to be done an inch at a time. This was evidenced at the 2006 ALSA Grand Nationals when he was the only llama to back between two 10 foot long pieces of climbing rope on the ground that had an inch of clearance from each wheel. 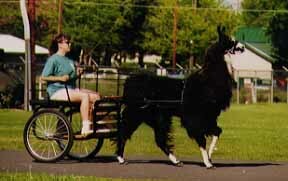 At the time of his death, Eagle was the only llama to be trained and driven by the same person and win the ALSA Grand Nationals in driving four times (2000, 2002, 2003 & 2006). Eagle's wins were done when most years had very full divisions of drivers. 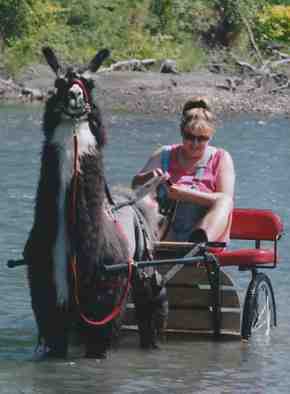 Early on Niki was approached to train other people's llamas for driving. Being a trainer, she knew that she could train them, but if the owner didn't know what they were doing the llama wouldn't perform. Her approach was to have clinics with the llamas, equipment and owners there. Several of today's trainers and national champions started at those clinics. Niki has done clinics all over the United States and even New Zealand. Beyond show driving, Niki and Eagle did a lot off road llama driving in rivers, trails, woods etc. 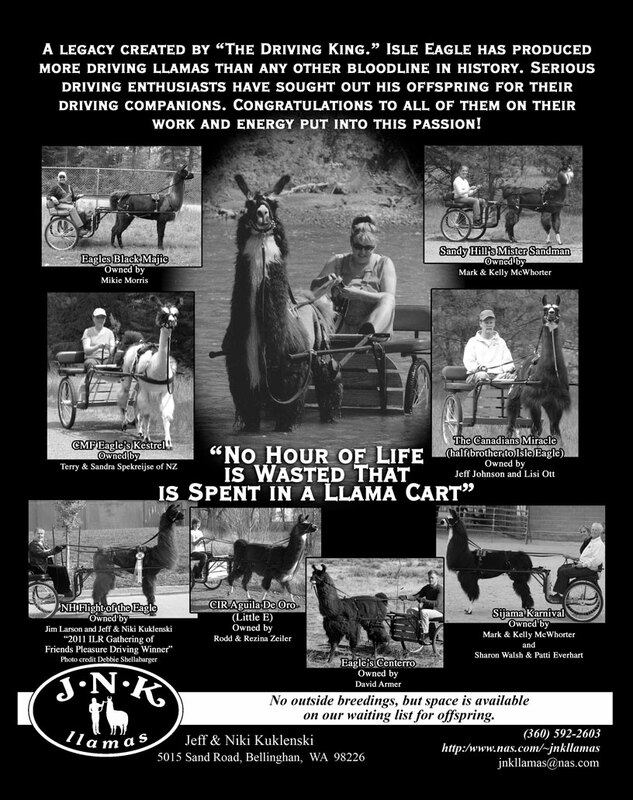 Niki and Jeff also trained several other llamas on their farm to cart drive and still have a group of animals they drive wherever they can! They have several friends around the NW they meet up and drive llamas many miles with. It is a passion and labor of love. A piece of their hearts died with Eagle. There will never be another Eagle again, it was an amazing ride in many ways! A legacy of athletic, smart and amazing offspring are left behind. Eagle has produced more drivers than any other llama in history. (see our Ad) He also has three brothers that drive! Everyone is always enamored with driving a double or triple team. After seeing a lot of the set-ups and being out driving with people attempting this type of driving, I would advise you to not waste your time or money. We do not make or sell equipment, so can say this with complete honesty! Double teams are slow, cumbersome and do not drive as easily as a single. 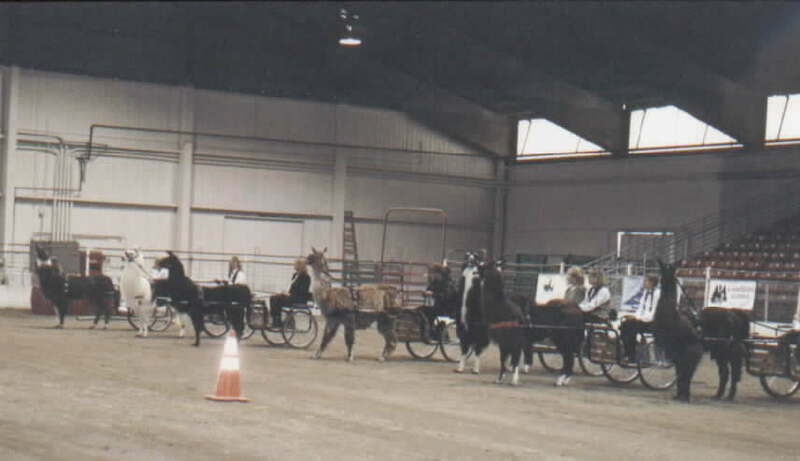 In addition, over the years I have seen numerous individuals steal the ideas of an early trainer called "Chuck Jean" where they throw the llamas in the cart between two other "supposedly trained" drivers and they are trained by the end of the weekend. After you buy all the equipment and head home with your llama, you still have an untrained llama most of the time and you just wasted a bunch of money on mediocre equipment that doesn't fit the llama right. (Yes, I have borrowed one of them and put it on my llama and attempted to drive) I have yet to see one of these set-ups (after watching people try to make it work when we were driving and bringing them to my clinics) that fits a llama correctly. Neck collars too are silly on a llama. Horses have a completely different neck structure than a llama. If I had a quarter for every llama owner that has walked up to me or contacted me saying they have a cart in the barn, attic etc. from one of these clinics, I would be going to Disneyland! Good drivers include the appropriate animal, good equipment and proper training (which takes time and energy). We are always happy to answer questions! Click ﻿﻿﻿HERE﻿﻿﻿ to see pictures of us driving with llamas!